Not too long ago, Hada Labo launched a new product in Malaysia. I was pretty excited because I myself have been using Hado Labo lotion for a really long time now because it's that good! So this new product must be up to par too. Really glad to be part of the launch event. I did not take any pictures though but thank goodness there was a lot of pretty bloggers there and that means lots of pretty pictures! Here's where the event was held, Acme Bar at Troika KL. Some awesome shots by Charmaine of food we had that day. 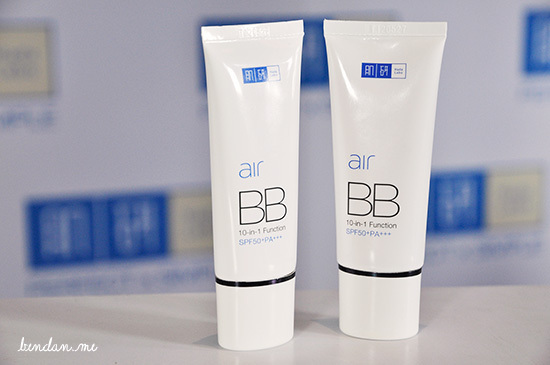 Now, introducing the star of the day, Hada Labo's newly launched Air BB. I think this is the first time Hada Labo launch a make-up product in Malaysia, correct me if I'm wrong, so it's really a big deal! We know the skincare products are good, but how about make-up? Packaging wise, I personally like it a lot because it is so minimal and sleek. 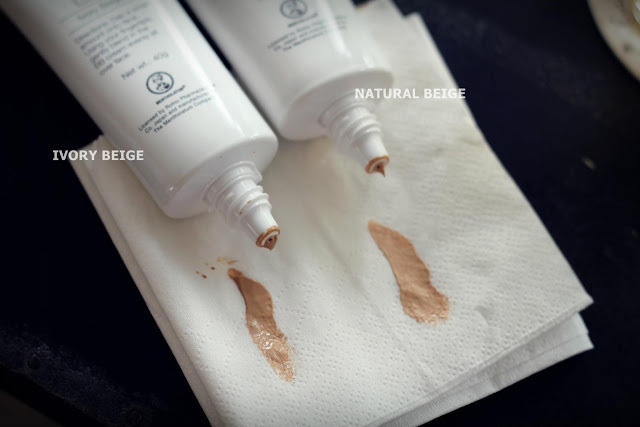 It comes in two colors: Ivory Beige, which is the darker one, and Natural Beige, the lighter one. You can see from here that the colors are not grey-ish like other BB Cream. The undertone color is really suitable for our Asian skin without making us look overly pale. You know how some ladies after applying BB Cream look like their faces belong to another body because the color simply do not match? Hada Labo Air BB doesn't give you that problem because the color matches and blends in so well. Texture-wise, it is just right. Not too watery and not too sticky, which makes application much easier. Also another unique point about Hada Labo Air BB is that its Silicone Elastomer* Blend ingredient allows it to give a really beautiful finish. Not only does it blend in evenly, it also creates this velvety finish that makes your skin looks radiant and dewy. This is why they call it Air BB okay! The texture is so light it feels just like air. *Silicone Elastomer functions to absorb various oils and sebum, while providing wrinkle-masking benefits. It gives the skin a smooth, silky and powdery feeling. For my skin tone, I used the lighter shade, Natural Beige. Here's how my skin looks like after using Hada Labo Air BB. Looks as if I've nothing on my face at all but it definitely does the job of covering redness and unevenness. Result? Smooth, flawless skin which feels silky when touched. 1. Apply moisturizer or lotion (such as the Hada Labo lotion) 5 minutes before to prepare the skin beforehand. 2. Use dabbing motion instead of rubbing. When you rub the cream on, you're actually taking away the cream away, so there won't be much coverage. 3. Less is more! Start with a thin layer and if it's not sufficient, only then comes the 2nd and 3rd. Too much at one go and you'll end up with cakey-ness. Using a brush makes it easier for blending. Adorable Kah Mon who was there too. Credits to her for the two pictures above as well. Finally a group shot of all the lovely bloggers! Next up, more Hada Labo reviews. Stay tuned!